Yeah baby. 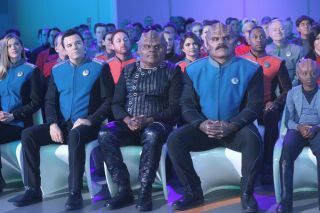 Lt Cmdr Bortus (Peter Macon), second from right, sports his new Magnum PI-meets-Freddy Mercury moustache in "The Orville" episode "A Happy Refrain." Up until now "The Orville" has wavered in what it delivered, giving the feeling that it was unsure of its own identity. However, last night's episode "A Happy Refrain" hits its mark and we were treated to the best episode since the Season 2 premiere, "Ja'loja." Isaac enters carrying a banana since he has noticed the doctor's "tendency to become cantankerous after 1600 hours if she has not eaten." He also mentions that she's changed her hairstyle, and Dr. Finn begins to realize she is developing feelings for the Kaylon artificial life form — setting up the primary plot for this episode and one that promises to be thoroughly entertaining. After the opening credits, Bortus casually walks onto the bridge sporting his new Magnum PI-meets-Freddy Mercury moustache and, in all honesty, it's really rather funny. Dr. Finn seeks out Cmdr. Kelly Grayson (Adrianne Palicki) and confides in her about her feelings for Isaac. She explains that it's probably been brewing since the shuttle crash that we saw in the Season 1 episode "Into the Fold" (S01, E08). Grayson reassures the doctor and suggests that she try and pursue it. After all, it's not like the doctor hasn't had sexual relations with other obscure alien life forms, for instance the sentient gelatinous Lt. Yaphet (voiced by Norm MacDonald) in "Cupid's Dagger" (S01, E10). Nervously, Dr Finn asks Isaac to accompany her to the symphony performance, which is taking place in a few days time. "Such an outing would yield substantial data regarding human behavioral patterns," he replies, which is, in this instance, Kaylon for "yes." Isaac (Mark Jackson) seeks relationship advice from Chief LaMarr (J. Lee) in "The Orville" episode "A Happy Refrain." Down in Engineering, Isaac approaches Chief LaMarr (J. Lee) and Malloy to ask their advice regarding his date. Lt. Dann (Mike Henry) is also there — always a pleasure to see — and of course when Yaphet hears that Isaac's date is with Dr. Finn, he's a little upset. After the duo give some genuinely good advice both Malloy and LaMarr sprint to the bridge to tell everyone, which creates an awkward moment when Isaac walks in. The comedy is handled just right and adds to this already very entertaining episode. Following the impressive orchestral performance, which kicks any quartet concert from "The Next Generation" into the shade, Dr. Finn and Isaac visit the doctor's favorite restaurant back on Earth by way of the holosuite. She talks about how she misses rain, but it seems Isaac already knows everything about the doctor by accessing her personnel file, which somewhat takes the fun of out getting to know someone. "My intent was to maximize efficiency so that our evening would conclude more promptly," he explains. A well-balanced mixture of both meaningful dialogue and misunderstanding-based humor make this scene work well. The date draws to a close and Dr. Finn gives Isaac a kiss before retiring to her quarters. Isaac (Mark Jackson) takes a hardlight form of a human, also played by Mark Jackson, to he can date Dr. Finn (Penny Johnson Jerald). He takes his post on the bridge, where everyone is aching to know how it went. Isaac explains that perhaps he should be more spontaneous, and Grayson and Capt. Mercer (Seth MacFarlane) share a story about how he once attempted to bake her a cake. Inspired by this and the apparent need to be impromptu, Isaac wakes the doctor in the middle of the night … with a cake. Understandably, she freaks and suggests that perhaps they should just return to how they were, in essence breaking up with him. Isaac again seeks the council of LaMarr, who is bowling in the holosuite with Malloy. Feeling the need to make amends for his earlier error, Malloy offers a brilliant suggestion. Isaac sends Dr. Finn a message to meet him in the holosuite, and upon her arrival she sees that he's adopted the hardlight form of a human, also played by Mark Jackson. He's also erased all his personal information about the doctor so that they can get to know each other properly this time. She's more than smitten with him and ultimately they end up in bed together. As she shares the story with Grayson and Lt. Talla Keylai (Jessica Szohr), it's clear that Dr. Finn is in love. However, down in Engineering Isaac asks LaMarr how it would be best to end the coupling since he has completed his experiment and gathered all the data he needs on this subject. LaMarr suggests he try and get her to break up with him in attempt to minimize the doctor's distress. What follows is probably the funniest scene in this episode as Isaac waits for Dr. Finn in her apartment, sitting on the sofa in underwear with his feet up and clutching a beer. "Ah, you are home," he says. "It is about time. I am awaiting my dinner. This has caused me to become displeased." She sees through his thinly veiled act and he tells her that his study has concluded, so it is no longer necessary for them to be together. The end result is the same as his intended breakup, and the poor doctor's heart is broken. When Isaac assumes his duty station, some of the bridge crew make snide remarks about the way he has treated Dr. Finn. While he doesn't appear to be upset, through simple body language he does appear to take what people are saying onboard. Dr. Finn, meanwhile, is in the holosuite drowning her sorrows with a drink. In a glimpse of MacFarlane's genius (he directed this episode) Yahpet has also taken hardlight human form and is portrayed by the same actor who voices him, Norm MacDonald. His efforts to woo the doctor, however, fall somewhat short. I'm just an AI from Kaylon-1, standing in front of a ship's doctor, asking her to forgive him. Isaac (Mark Jackson) apologizes for his behavior to Dr. Finn (Penny Johnson Jerald). After Isaac makes a mistake during a calculation on the bridge — unheard of for a Kaylon — and he learns that Dr. Finn has found someone else to teach her son Ty (Kai Wener) the piano, he fakes a message for the doctor to report to the bridge. Once there, he has "Singing in the Rain" play over the ship's speakers and initiates an environment systems override to activate the bridge sprinkler system. Completely bewildered, the entire bridge crew gets utterly soaked in a touching moment that is both amusing and moving. Isaac stands before Dr. Finn and apologizes for his behavior. He also says that he wishes to continue their romantic coupling, so how that plays out remains to be seen. In true epic musical fashion, like those that MacFarlane loves so much, the episode draws to a close on an uplifting note and Malloy voices what we're all thinking: "We are, without a doubt, the weirdest ship in the fleet." Before the end credits roll, Dr. Finn and Isaac walk once again into the holosuite, hand in hand — and as the door closes, we just see him take his hardlight human appearance. "The Orville" is taking a one-week break and returns on Feb. 14th at the usual time. However, keep an eye out for our exclusive interview with Mark Jackson, coming soon. Season 2 of "The Orville" is on Thursday nights at 9 p.m. ET on Fox in the US. It can be watched on demand on FoxNow and Hulu. It's also available on Fox.com in the US. In the UK, it's on Thursday nights at 9 p.m. GMT on Fox. The first season of "The Orville" is available to buy on DVD and a season pass can also be purchased from Amazon.